In the most recent Water Board Water Conservation Report showing the state's June 2015 conservation, LADWP has been revising population figures presumably to keep the Residential gallons per capita daily (R-GPCD) level from getting out of control. They are now estimating monthly population growth and using each months figures to calculate residential water use. I was surprised they kept using the 3,935,257 figure from month to month since leaving the population number where it was would have artificially raised the R-GPCD while population and demand increased. The screen shot from the report shows the department's estimates that the city has grown by 55,089 residents in last twelve months (or roughly 19,674 new units1 constructed) while it has been losing water supply. RHNA forces cities to identify properties that are suitable for development for the number of units they are allocated for. Despite the 7 year long water deficit the city has been fighting, the increasing population numbers that the LADWP is providing is a result of the California's RHNA requirement. If a developer wants to build on a property identified in the Housing Element (a RHNA requirement), the city can't say no by state law unless the UWMP or WSA is successfully challenged. Any gains being made by residents to recover from the drought (turf removal, limiting landscaping watering days, low flow toilets, high efficiency washers, etc.) to increase storage levels and reserves are simply wiped out the state and city planning process. 1 2013-2021 Los Angeles Housing Element reports average of 2.8 inhabitants per dwelling unit. In a recent article I wrote that California's biggest danger to water reliability isn't the lack of dams or groundwater, it was the State's growth policy that's forces city's to build. In its drive to produce housing to meet a desktop analysis that says the state will grow to ~51 million people, the state uses a little known legislative law called RHNA that 'tells cities' throughout the state how many units they must provide for. The cities must then answer in response by identifying properties (and even re-zone to allow for higher densities) where developers can build those units if the properties become available on the market. Recently a news article listed Nine California cities running out of water. Most of them are in the central valley where it is especially bad. To emphasis how disconnected the State's RHNA process to the water challenges that cities face, I've provided is a list of those nine cities along with the number of units each city's is allocated to provide for and a rough estimate1 on how much water will be needed to support those units should they be built out. On one hand each of theses cities are confronted with a huge water deficit resulting in an unreliable water supply and on the other hand the State is pushing them to increase housing in places where its no longer practical. Literally RHNA is running cities out of water. The housing allocations are running up water demand to the point where cities have insufficient supplies. Between the 2006/2013 and 2014/2021 RHNA allocations, the City of Los Angeles has had to identify properties that could be developed for 194,000 units. In the most recent Water Board Water Conservation Report, LADWP has been revising population figures presumably to keep the Residential-GPCD level from getting out of control. They are now projecting monthly population growth and using each months figures to calculate residential water use. The screen shot from the report shows the city has projected that it has grown by 55,089 residents while the water supply has dropped. RHNA forces cities to identify properties that are suitable for development for the number of units they are allocated for. Despite the 7 year long water deficit the city has been fighting, the increasing population numbers that the LADWP is providing is a result of the California's RHNA requirement. If a developer want to build on a property identified in the Housing Element (a RHNA requirement), the city can't say no. 1RGPCD data in the May '15 Urban Water Supplier Report was used as a basis for each cities demand. The state’s biggest challenge in meeting the population’s water supply requirements isn’t conservation, it isn’t lack of infrastructure, not storage, and not groundwater. It’s RHNA, a little known wonkish piece of legislation embodied in Government Code 65580 that's mostly known to planners, developers and city hall staffers. What follows might sound like we’re veering away from the focus of this blog but stick with it, RHNA affects water demand (and electric power and traffic) in a very heavy handed, mindless way. You’ll see why. RHNA (Regional Housing Needs Assessment) is a law that requires the state Department of Housing and Community Development (HCD) to establish the region’s existing and projected housing needs. RHNA prods and some might say it threatens cities into produce housing and while it presses for growth, nowhere in the state level is there an evaluation as to whether the water supply is available. The RHNA process starts out with population projections generated by the state’s Department of Finance (DOF). These population figures are then sent to HCD which takes this data and develops regional housing (RHNA) allocations. The allocations, spread out evenly between Northern and Southern California, are distributed among 38 regional planning agencies through a RHNA Determination Letter. Every region in the state has a planning agency that assigns housing allocations to the cities and communities they oversee. When regional planning agencies receive the Determination Letter, they take the regional RHNA allocations in it and break it down to city level RHNA allocations. When the HCD sent Southern California its Determination Letter showing RHNA allocations (pdf), the Southern California Association of Governments (SCAG) w­­­as assigned to provide between 409,060 and 438,030 housing units to be spread out among its 191 cities inside Los Angeles, Orange, Riverside, San Bernardino, Imperial and Ventura counties. The planning agency that represents San Diego (SANDAG) was assigned to provide 161,980 units. To name a few other regions, if you live in Fresno its planning agency (FCOG) was assigned a RHNA allocation of 41,470 housing units. Kern’s planning agency (KCOG) was assigned a RHNA allocation of 67,675 housing units and the San Francisco Bay Area agency (ABAG) was allocated to provide for 187,990 new units. Regional planning agencies simply accept the HCD numbers at face value. This step in the RHNA process tends to get a little ugly. Using a number of factors such as jobs, density, transportation, income levels, developable land, the regional planning agencies divide up their regional allocations into city level RHNA allocations (pdf). The regional planning agencies do not evaluate whether there is a sufficient water supply available to support housing requirements when they impose the allocations on the cities or communities. This is where the disconnect, intentional or not begins. Some cities like Los Angeles accept these housing allocations with reckless abandon and run with it while other cities like Irvine, Palmdale, La Mirada and Pleasanton have tried unsuccessfully to challenge the regional agencies role and RHNA allocations in courts. In Irvine, the city had designated a decommissioned naval base to be the site of the “Orange County Great Park’. However, SCAG saw its potential as a huge housing development and applied a RHNA allocation of 35,660 units to the city. Pleasanton sought to limit growth with caps that were approved by voters but was sued because their housing plan they did not comply with RHNA. The next and final step in the RHNA process is at the city level. Each city after having received their share of RHNA allocations must now incorporate it into a housing plan called the ‘Housing Element’. The Housing Element identifies the locations of all the parcels in the city that are candidates for higher density growth and is one of the eleven 'elements' that goes into a city's 'General Plan'. This is effectively the only place throughout the RHNA process where water supply comes into play, albeit indirectly. Clearly the adequacy of the water supply in Los Angeles is demonstrably untrue, but there is no regulatory oversight anywhere in the RHNA process that will halt a project when there is no water to support it. If the water plan is based on faulty assumptions, the project will glide through to approval making it nearly impossible to create a reliable water supply. 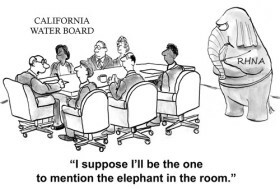 But while its happened from time to time it’s not a process that citizens are familiar with and having citizens challenge thousands of projects a year one by one to enforce SB 221 and SB 610 (the “Show me the Water Laws”) is an undue burden. Furthering the burden, the State has legislation such as SB 1818 that allows cities and developers to squeeze more units into a parcel even when its zoned for lower densities. Cities are not likely to challenge a developers rights to construct housing if the allocations have not been met. RHNA’s complicated process give developers the legal foundation to build new housing and sue if cities don’t cooperate, even when it is obvious to everyone that there is no water available for the project. So where’s RHNA going to take us? 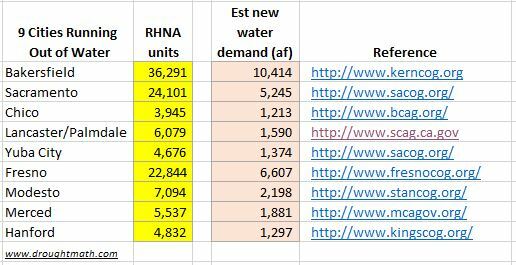 RHNA is driving up water demand. The Housing Element is updated every eight years and new RHNA allocations come out for each new refresh so what we see every eight years are just small chunks of the housing allocations which keeps the long term past and future view pretty well hidden. 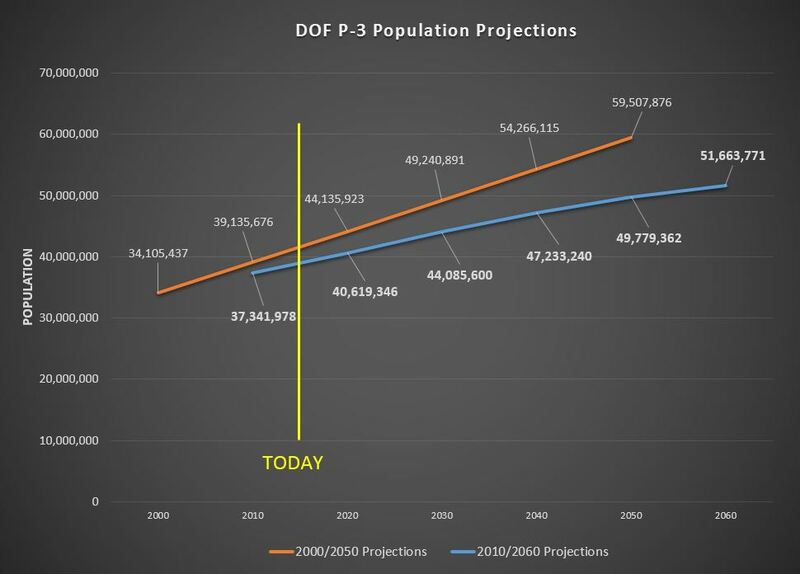 Because RHNA takes its cue from DOF population projections which extend 50 years, if you want to know where RHNA is taking us look no further than the DOF P-3 projections. These fifty year projections can swing up and down quite a bit. The 2050 projections were reduced 10 million people between the 2006/2014 and 2013/2021 but the damage is already done despite the reduced projection. L.A.'s last RHNA allocation was 112,876 and it led to a large number of permits being approved though not all of them were necessarily built given the economic crash that occurred in 2008. However, once entitled, they stay entitled. When the economy picks up, the construction can begin. The latest RHNA allocation for Los Angeles dropped to 82,000. 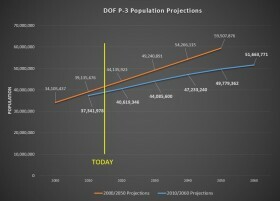 The current DOF projections show the state growing to a population of 51,663,771. With this we can expect the RHNA to increase the density to increase 16% by 2030 and by 32% by 2060. A 32% increase in the City of Los Angeles suggest that water demand would increase over 938,000 Af/y if the city’s demand was held at the current 142 gallons per capita daily. That’s is about 356,000 acre-feet a year over the city’s actual average supply. But realistically, if the RHNA process continues unrestrained by water supply, the city would have to reduce the demand to 88 gallons per capita daily to meet 2060 population targets. This is not “residential gpcd”, this is the entire city’s demand including commercial, industrial, government and residential! And what's worse.. this is just the City of LA. Imagine how disastrous and frequent droughts will be when the state hits its 16% growth target by 2030 and 32% target by 2060. California can never have a reliable water supply unless serious reforms are made to RHNA.